You can delete a contact from your phone by using the Contacts function. The user also has the option to cancel the synchronization for the account in order to erase all the numbers associated with it. If your contacts are stored in a Google Account, it is recommended that you use the Contacts website to control them. To remove a contact from Android, you need to log into the "Contacts" application. This program may be called differently, and it will depend on the mobile device that is used. It is necessary to click on the record you wish to erase. As a result, contact information should be displayed. If you want to erase several items, you can click on the 1 of them and hold your finger for some time, as a result, the selection mode is activated, and then specify additional names that need to be cleared. This process may vary noticeably on some device models. Now you can click "Delete". The location and design of this button will differ on different devices, but, as a rule, it can be found in the upper half of the screen. Sometimes it looks like the inscription "Delete", and in other cases - as an icon in the form of a trash can. In some cases, the user will first need to click a button in the 3 view of vertically located points, and then select the "Delete" option. You must click "Yes" to confirm that you want to erase the selected items. The user will be asked if he understands that the contacts will be permanently deleted from the mobile device. Need to confirm the operation. To disable an account, you must go to "Settings". When disconnected, all numbers that were synchronized will be deleted. This can be useful for erasing a large number of points in 1 times. You need to select the "Accounts" option in the "Personal Information" section. Now you should select the account for which you want to disable synchronization. Any numbers from this account will be deleted from your device. 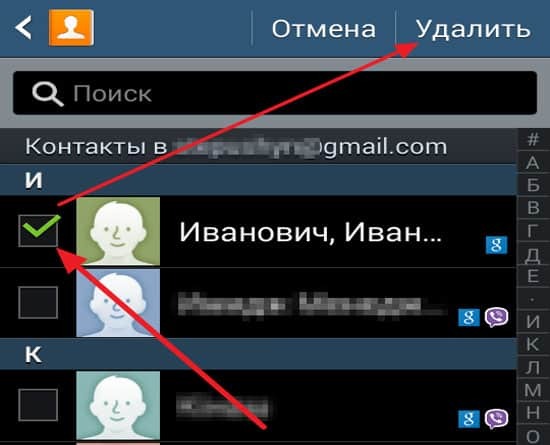 If you are interested in how to delete a phone number, then you need to keep in mind that, by turning off contacts, you can stop their synchronization so that the list is not updated automatically with the account. If you do not see the "Contacts" option, you need to completely disable synchronization for your account. Next, you need to press the button in the form of vertical points 3. Usually it is located in the upper right corner. A small menu should open, in which you should click the Sync button. This activates the interaction with the account. Since contacts have been disabled, all items for this account will be erased from your device. To delete Google numbers, you need to open a web browser. If you store numbers in your account, you can use Contacts to more effectively manage them. For this purpose it is allowed to use a special site. This method is intended only for items that are stored in the account. Numbers located in the phone’s memory or on another account must be removed separately. Using the browser, you need to enter the Contacts. To do this, use the same account as on your Android device. Next, click on the profile photos of the contacts to select them. The search bar at the top of the page helps you quickly find the numbers you need. You must click on the button with the image of the basket at the top of the screen. This will remove all selected numbers from your account. If the cart button is inactive, then 1 or several items you have selected are added using Google+. To remove them, you need to erase the numbers from the Circles. Next, you need to open the "Settings" menu on your Android device. After removing the numbers from the Google Contacts website, you’ll need to re-sync your account on your Android phone. You must select the "Accounts" option, which can be found in the "Personal Information" section. Now you need to select "Google". If you have several accounts, you should select the one that needs changes, click the button in the form of 3 vertical dots. Usually it is located in the upper right corner. You need to click "Sync" in order for your Google account to exchange data with your contacts. Any items you delete on the Contacts site will be erased on your Android device. To remove contacts from a SIM card, you need to enter the corresponding section of the application with numbers. On each phone models The location of this section may vary.